Modifying system files and changing system configuration may get reported as malware by some antivirus software. You need to temporary turn-off antivirus software so that program won't be interfered during installation/uninstallation. If you feel insecurity with this, you can consider Windows 8 UX Pack as it doesn't involve modifying system files. Edited by Siraka_Serion_Semi, 04 May 2014 - 11:41 PM. It looks pretty good. Well done Windows X, as always. Happy b-day Windows X. All your theme packs are really amazing! I've just upload a new build that have fixed the following issues. If you don't have any problems with stated fixes, you don't need to reinstall it. But regardless of your result, I suggest to keep this updated build in hand just in case. Happy belated birthday Windows X. You should have posted some more screenshots. Version 2.0 is released. It comes with full featured Windows 8 Developer Preview update. MD5 Hash of "Windows 8 Transformation Pack 2.0.exe" is 9bfc0f590bc7d2ba3ec2c3de09a046e3. It's about one month after Windows 8 Consume Preview being released. Finally, all the changes since Developer Preview are reviewed and implemented. This time I'm trying to unify both Transformation/UX Pack to have the same version to avoid confusion To make things clear again, UX Pack works similar to Transformation Pack but without system files modification and can be installed on Windows 7 only. 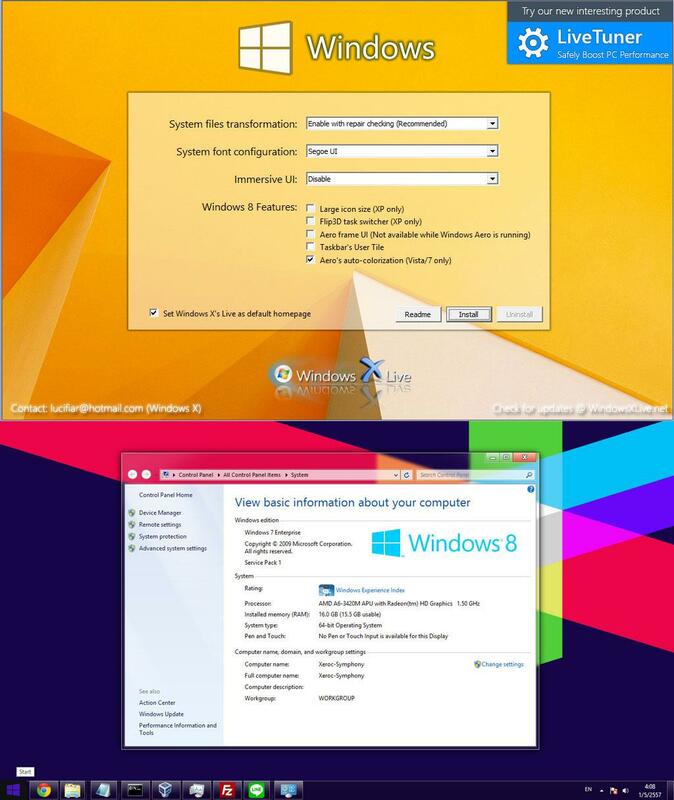 Now Windows 8 Transformation Pack is safer and more reliable with improvements from Lion Transformation Pack and along with its feedback. All detected bugs are now fixed along with better ways to handle transformation improved from Lion Transformation Pack. New resources are implemented in proper ways to use. Try icons look nice now and new Windows branding inspired a few places to update. New Segoe fonts rock and existing font will be updated without trouble. It's available only for Windows 8 Transformation Pack though as UX Pack is promised to not modify anything at all. Charms Bar is now implemented for people who can't get full Immersive UI to work well. And best of all, there're a lot of visual changes that you shouldn't miss especially XP users will be in great joy. MD5 Hash of "Windows 8 Transformation Pack 4.0.exe" is e27ea0686d89b977d5d47032288b1b2b. MD5 Hash of "Windows 8 UX Pack 4.0.exe" is 9ae2b119e9fbbcfed07476a29b99fc2e. Edited by Windows X, 30 March 2012 - 03:39 PM. Great job Windows X. The UX pack is fantastic! base on the preview it looks awesome. XP? There's actually a WinMatrixian who use XP? Finally a transformation (UX) pack which is safe to use. Windows 8 Transformation Pack 5.0 is released. Now it comes with Windows 8 Release Preview updates. I hoped to make it out sooner but I was too busy with other things until about one month after Release Preview release. Edited by theapu, 16 July 2012 - 06:16 AM. Windows X, you are the man! Windows 8 Transformation Pack 6.0 is released. Finally settled for Windows 8 RTM build. I may probably update this again with improved themes and enhancement tools. MD5 Hash of "Windows 8 Transformation Pack 6.0.exe" is eda006853a5f29e5dabd3c616150c00e. Edited by Windows X, 06 September 2012 - 03:55 PM. Metro UI i snot working for me. I checked MetroUI while installing. But it charms bar dektop is cominf after logging in. Version 6.5 is now released, mainly bugs slaying and some improvements for better user experiences. MD5 Hash of "Windows 8 Transformation Pack 6.5.exe" is c97395665a03544c6740b919e8f86432.